Agnieszka (ag-NYESH-kah) lives in a valley bordered by the dark and corrupted Wood. Filled with beasts of nightmares and the ability to corrupt anyone who gets too close, Agnieszka’s home is protected from the Wood by the Dragon. But the protection comes at a price, every ten years the Dragon, a very powerful wizard, takes a girl to his tower only to release her a decade later, completely changed. When Agnieszka is shockingly chosen to go with the Dragon to his tower for the next ten years, she finds out why he’s been taking the girls and the difference between them and her. 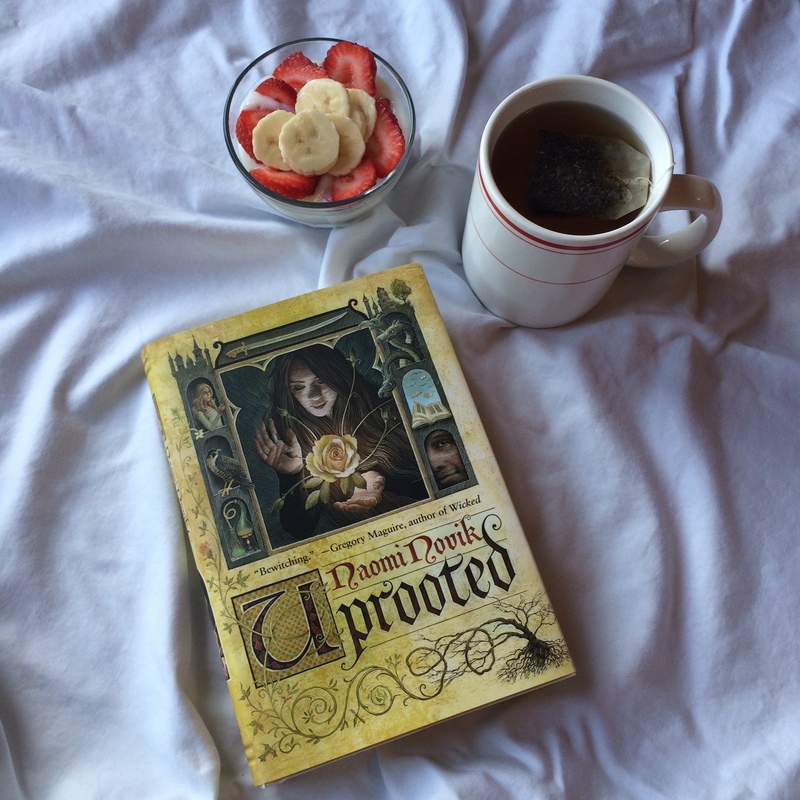 The journey through Uprooted is overflowing with adventure, dark and creepy creatures, and so much magic! As a standalone, it’s a too often occurrence that, as a reader, you don’t feel like there is enough to a story in the one book. But in Naomi Novik’s little more than 400 pages, she creates realistic and relatable characters, life-saving battles, and satisfying conclusions to all your questions. Probably my favorite part of this book is Novik’s way of describing magic. It’s enchanting how spells are depicted as picking through brambles to find paths through the woods. The metaphor is so strongly put together and followed throughout the book, you feel like you could do magic right along with the Dragon. Novik creates a world you want to jump into and simultaneously run from. The ability for the Wood to corrupt, or basically possess, people is beyond terrifying. The only things stopping me from giving this book a full 5-star rating is, first off, it would have REALLY benefitted from a map. I find it to be so very helpful for a fantasy book that is creating a kingdom with obscure names. Especially when they are constantly traveling through different villages. Secondly, the plot was somewhat difficult to decipher at parts. I wasn’t always sure where the story was supposed to be going. Was it just about her time in the tower? A battle with the kingdom? A fight against the Wood? Saving the Queen? It was so full of different adventures, each one with its own plot, that it was hard to decide what the plot of the entire book as a whole was. Overall, Uprooted is my new favorite standalone. It’s charming and just so beautifully put together, you never want it to end. This book a very highly recommended by me. Do you love Uprooted as much as I do? Let me know what you think of the book in the comments!